Meat Mincer BJRJ-200D - Hangzhou Expro Machinery Engineering Co.,Ltd. 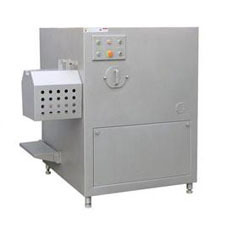 BJRJ-200D frozen meat grinder can directly grind big frozen meat lumps above -15 into various sizes. It avoids the meat loss during de-freezing. 16mm-hole-plate or larger is required when grinding frozen meat directly. The machine is also used for grinding fresh meat. Safety guards are installed on the discharging area and the top cover.